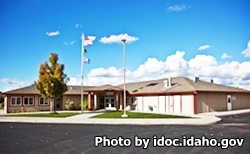 South Boise Women's Correctional Center is located in Kuna Idaho. It acts as both a treatment and transitioning center for female inmates. Minimum security female inmates who are close to release can receive pre-release counseling and preparation. The institution can house approximately 284 inmates. Offenders incarcerated at South Boise Women's Correctional Center can participate in behavioral modification programs, education and vocational classes, as well as receive various work opportunities.. Visiting is divided by unit. Because the visiting shedule rotates every few months you should contact the institution to ensure the visiting schedule is still in this current rotation. Unit 1 has visitation on Saturdays 9am-12pm, you must arrive 8:45am-9am for the first block of visitation, and between 10:15am-10:30am for the second block. Visiting on Sundays is from 1pm-4pm, you must arrive between 12:45pm-1pm for the first block and 2:15pm-2:30pm for the second block. Unit 2 has visitation on Saturdays from 1pm-4pm, you must arrive between 12:45pm-1pm for the first block, and between 2:15pm-2:30pm for the second block. Sunday visitation is from 9am-12:pm, you must arrive between 8:45am-9am for the first block, and 10:15am-10:30am for the second block. Riders/Parole Violators have visitation on Saturdays 9am-12pm, you must arrive 8:45am-9am for the first block of visitation, and between 10:15am-10:30am for the second block. Visiting on Sundays is from 1pm-4pm, you must arrive between 12:45pm-1pm for the first block and 2:15pm-2:30pm for the second block. Timers have visiting on Saturdays from 1pm-4pm, you must arrive between 12:45pm-1pm for the first block, and between 2:15pm-2:30pm for the second block. Sunday visitation is from 9am-12:pm, you must arrive between 8:45am-9am for the first block, and 10:15am-10:30am for the second block. 13200 S. Pleasant Valley Rd.